Panelboards split power feeds into secondary circuits while providing a protective circuit breaker for each circuit housed within the enclosure. Panelboards are a component within an electrical supply system. Panelboards split power feeds into secondary circuits while providing a protective circuit breaker for each circuit housed within the enclosure. The average person knows this object as a circuit breaker or the “fuse box” located in the attic or basement of their home. However, a qualified power professional understands that a panelboard’s capacity and construction will vary, depending on the power needs of their customer. Selecting the right panelboard will help ensure that it can safely accommodate the power equipment that will be housed inside and used on a daily basis. Proper selection and installation of panelboards in Cleveland and Northeast Ohio, will also ensure that your work will not be cited by the city inspector. Making any initial type of power installation or electricity change is a major task and should not be done quickly or haphazardly. 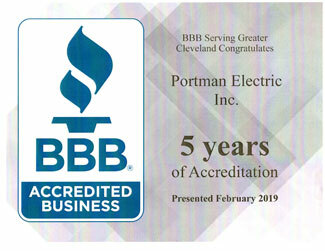 Through thoughtful consideration and consultation with electrical power professionals such as as found at Portman Electric, Inc. will guarantee success. 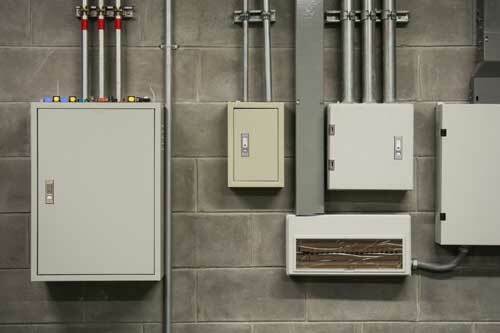 As Industrial and Commercial electrical contractors with 28 years of electrical installation experience we at Portman Electric thought it would be helpful to create a checklist to assist in the process to ensure the best panelboard solutions are selected and installed correctly so they can function safely. If you use conductors whose temperature ratings exceed those of other components for your ampacity adjustment, you will be out of Code. The Code has extensive instructions which limit the ampacity/temperature ratings when you go beyond 100A. It is vital that you follow these codes when determining conductor ampacity, because “The Code” requires that the temperature column match the temperature rating of the weakest connected termination, conductor, or device in the circuit. The Code requires bonding jumpers around them to be over 150v. Depending on concentric knockout rings to give you adequate grounding continuity with leave you with a huge problem. Specific panelboards that are furnished “without knockouts” or “with blank-end walls” can eliminate this concern while cutting conduit openings at the instillation site. The function of the main bonding jumper is to give you “system grounding”. If the transformer is upstream from the panelboard, you must bond the neutral bus or neutral conductor to the panel enclosure with a grounding-electrode conductor. The Code, allows for some exceptions for ungrounded service. However, most feeders serving this installation, like 120/240V, 3-wire, or 4-wire 208Y/120V and 480Y/277V circuits, require that the two remain electrically separate. The Code does not permit applying “slash” ratings to ungrounded, resistance-grounded, or grounded-delta systems. So it is important that you watch out for multi-pole, molded case circuit breakers rated 120/240V or 480Y/277V. To limit the degree of shock/flash hazard during service and replacement of the trip unit, terminate the incoming cable only to the line side of the breaker. When determining the components that are integral to your panelboard , consider whether you have an upstream overcurrent device or have disconnecting means in place. If you are feeding the panelboard from tap conductors, then you will usually need to install an external-fuse switch or circuit breaker upstream of the MLO panelboard. Prior to installation you want to make certain that you have the right breaker. Each ungrounded overcurrent-device pole is secured to the panel bus by a bolted connection using a machine screw. No longer will you see a connection using a spring-clip-type conductor.